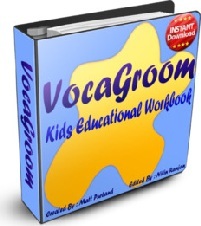 Woooffing Kids Dog Games Ideas. Looking for some Grrr…et kids dog games ideas for your canine adoring kids? Well, you have landed at the Perrr…fect place for that. Wagging the tail, licking the face, barking at strangers, rolling on the floor, biting the bones & trendiest names all these things reinforces the platonic relationship that a man shares with a Dog. 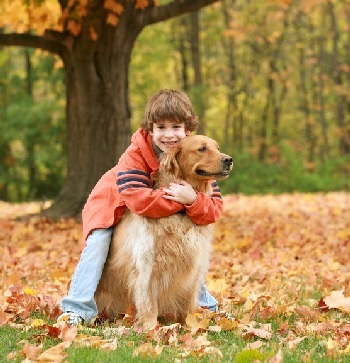 Kids, especially, share a very special bond with their pup or Dog. Therefore, parents can always plan a Dog theme party for their kids and their friends. They will have a rocking time playing Dog themed games and activities. If you have planned or wish to plan one such gala time for kids then try the following Kids Dog games ideas. Throw the party bone and be amused to see them going Wooff-Wooff with fun and frolic! Don’t forget to check out some cool Dog Video Games and Dog Board Games here! If you have a pet Dog at home then it’s needless to say that you love him & take good care of him just like another member of your family. In that case, I would recommend you to visit a very friendly website that gives practical tips, advices and information about Dogs & Puppies. You will find fresh ideas on how to throw a Dog Party as well! Game Objective: In this kids dog game kids have to look out for clues and search for the dog and his puppy. Game Learning: Sequential thinking, Dogs breeds. No. of Players: 5-6 players. Dogs and Puppies stuff toys. Buy 5 pairs of dogs and their puppies stuff toys. Each pair should be of different breed, color or look (whichever is available). If this is not available, then buy some dogs and their puppies posters. Give some suitable name to each one of them. For example, Ceasar, Bozo, Liza, Candy and Goofy. The respective puppies can be named as Ceasar’s puppy, Bozo’s puppy and so on. Each dog’s breed, name & location (Lable-1). Each puppy’s breed, name & location (Lable-2). Stick Lable-3 on respective Dog. Stick Lable-4 on respective puppy. Stick Lable-2 on respective Dog. Hide all the dogs at a certain location (same or different locations you decide), say living room & bed rooms. Hide all the puppies at some different location like – Lobby, back yard or study room. Hide all the Lable-1 in the front yard like (same or different place you decide) – inside your car, mail box, Flower Pot etc. When the game starts divide the kids into teams, pairs or let them be individual depending on the number of kids playing this game. Instruct them that they are Navy Seal’s Sniffer Dogs and have to trace out their fellow dogs and their puppies from the hidden locations. Ask them to sniff in the front yard for the first clue (Lable-1) and take it further from there. Let the kids play the role and task given to them with fun. The kid/team who would find his lost dog and the puppy first will be the Winner of this wonderful kids dog game. This game can also be played on a Birthday party, Christmas party or Halloween party. Do all the preparation beforehand. Game Objective: This kids dog game is played on the lines of musical chair. A pack of dog bone shaped kid’s candies. A CD player with an audio of the famous song “Who Let the Dog Out!” by Baha Men. Create a virtual dog house out of it by using your bed sheets. Idea is to create a sort of dog house having 2 doors, on at the front and one at the back. To give it a feel of a dog house you can decorate it with pictures and posters of dogs and puppies. You can also stick some dog bone pictures around it. Cut out a round card stock paper and write “Bozo’s Den - Enter at your own risk” and stick it just on the top of the “Entry” door. Put all the dog bone shaped candies in a bowl and place it inside the dog house. Before the game starts instruct the kids that they have to play as dogs and as the music starts they have to crawl inside the dog house from the Entry door, one by one in a circular fashion , pick up a candy in their mouth and get out from the back door. The kid who gets trapped inside the dog house when the music stops will be eliminated. The last kid remaining would win this fabulous dog game for kids. This kids dog game can also be played with a Dinosaurs theme. Just replace the dog bone shaped candies with Dinosaur egg. Click here to know more. Game Objective: In this kids dog game the doggy has to fetch the bone before the other can. No. of Players: A group of 8-12 kids. Draw a big dog bone on a white drawing sheet. Paste it on the card board using glue. Cut out the dog bone. Now, draw a circle on the ground and place the dog bone at the center. Take ten steps away from the circle and draw a Start line. Similarly, draw another start line on diametrically opposite side of the circle. Make the teams line up behind their respective start lines in the descending order of their heights (the tallest kid on the front and shortest at the back). Give some cool dog names to each corresponding kid of both the teams, such as – Rock, Donzo, Ella, Tipsy, Pluto etc. Kids have to stand with their legs wide open, just like an inverted “V”. When the game starts the judge calls out a dog’s name. For example, Pluto! On this, the Plutos’ of both the teams have to bark once (“Woof-Woof”) and crawl on their knees (like a dog) from under the legs of their standing team mates and reach the circle. Once they have reached the circle then they can stand back in normal position. Both the Plutos’ will now move around the circle keeping an eye on each other and look for the best opportunity to quickly grab the dog bone and rush back to their respective start line without getting tagged by the other one. If the Pluto, running back with the dog bone, is tagged by the other one before he crosses his respective start line, then his team will lose one point and the opposition will gain one. If the Pluto succeeds then his team will gain one point and the opposition will lose one. Play for 10 rounds and the team with more points will win this superb kids dog game. A very good kids dog game to be played at a dog themed Birthday party. Game Objective: In this kids dog game the players have to complete the doggy tasks to win the race. Some hot dogs cut into halves. A liquid water color bottle. Some small sized white drawing sheets. Dog bone shaped candies or chocolates. A few bottles of flavored milk. 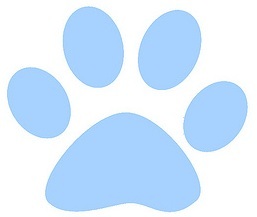 Create 4 doggy theme obstacles, as follows, and place them evenly between the start line and the finish line. First obstacle will be a Hot Dog wrapped properly in a food packing foil and keep it on a party paper plate. Second obstacle will be Flavored milk in a bowl. Third obstacle will be making a dog paw impression on the drawing sheet using the liquid water color given in a saucer. 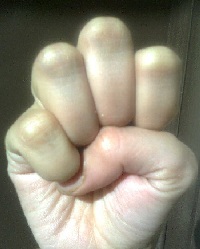 A kid can create his own dog paw impression by his hands as shown. Just dip the fist in the color and press it against the paper. Fourth and the last obstacle will be tossing the dog bone shaped candy through the dog’s mouth (poster) that is hung at a fair distance. In the dog poster cut out a circular hole near the mouth of the dog. The hole size should be such that the candies can be tossed through it. Give some good dog name to every player and let the relay begin. He has to eat the Hot Dog first and then crawl on his knees like a dog to the next obstacle and drink all the milk without using his hands. Then he has to crawl to the next obstacle and create his dog paw impression on the given sheet. Finally he has to pick up the dog bone shaped candies/ chocolate and toss them through the dog’s mouth (poster). Each kid will be given 5 candies to toss. Tally the timings and the kid who has taken the shortest time will win this fun kids dog game. My Tip: If you have sufficient space and required supplies then let this relay race unwind with all the players racing simultaneously. This will make this kids dog game more live and bubbling with fun. Game Objective: In this kids dog game the players have to get dirty to win the race. Large size inflatable kids water pool. Styrofoam balls or Ping Pong balls. A pack Wrapped bone shaped candies. Fill the inflatable kids pool with lots of play sand. Hide lots of wrapped dog bone shaped candies inside it. Draw a start line at a fair distance from the pool. Give some cool doggy names to all the participating kids and make them kneel on their knees at the start line. As dogs love to play with balls, so ask the kids to hold a tablespoon in their mouth with a Styrofoam ball or a ping pong ball on it. On hearing the work “Doggies Shoo”, all the kids have to move towards the sand pool like a dog. If someone drops the ball in between then he has to restart the race from the start line. On reaching the sand pool the doggies have to dig up the sand like a dog and search for the hidden dog bone candies. Set a time limit for that and the kid who has found the most number of dog bone candies would win this fun dog games for kids. If you live near a beach then that would be the ideal place to play this muddy kids dog game as you can find ample sand and the kids will get a cool surrounding to have fun. Game Objective: A kids dog game where kids have to pin the tail of the Dog. Stick the Dog’s poster on the wall. Kid who has placed the tail closest to the actual position WINS this evergreen Dog game for kids!!! This evergreen kids Dog game can be played as a birthday party game like pin the Hat of the Pirate! Or pin the magic wand of Harry Potter!!!. Other kids waiting for their turn can try to confuse the blindfolded kid by saying up…down…a little bit left, slightly right…Let the kids Dog game party go wild! Game Objective: A kids dog game where kids have to enact their respective Dogs. Your kids sure have pals…right? Summon all his/her buddies to come over to your place with their Scooby Doos’, Snoopys’ & Plutos’ and get Rrrredy for a Grrreat time…Woof-Woof!!! Dogs are a child’s best friend! They both love each other more than anything and share a very special bond. Throw up a challenge among kids to prove how much they know and understand their canine companions. Ask the boys to line up and bark like their dogs. Make them mimic different barking styles of their dogs. Every breed of dog has its own distinct look and traits. Entice the kids to enact their dogs, make faces and expressions so that they look like their dogs. See and judge how closely they can resemble their dogs. This will be a hilarious kids dog game. Keeps some prizes handy to reward the winners! Girls like to dress up their stuff. Throw a girls party and tell them to bring their Stuff toy dogs and puppies or even real dogs with all their dresses and accessories. Open your dressing wardrobe for them. Keep all the dressing stuff at central place and divide the girls into teams of 2-4. Fix a time limit say 15 minutes and let them dress up their dogs and puppies. Judge the best one and give a small prize to the team who WINS this kids Dog game. Don’t forget to explore our exclusive section of Online Dog Games , Kids Board Games & Kids Video Games to find reviews and recommendations of the best games available in the market today.